Has anyone encountered Beuvarin/Buverin (transliterated variously), a Thai-brand biological insecticide containing spore of Beauveria bassiana, in Bangkok? I'm looking to source a small amount for home use. Can you identify this pest and help us to kill it before it kills our wondrous tree? We are in Chiang Mai. The most notable characteristic of this flowering shrub is that flowers of three distinct colors appear on the bush simultaneously as the blooms color cycle independent of one another. 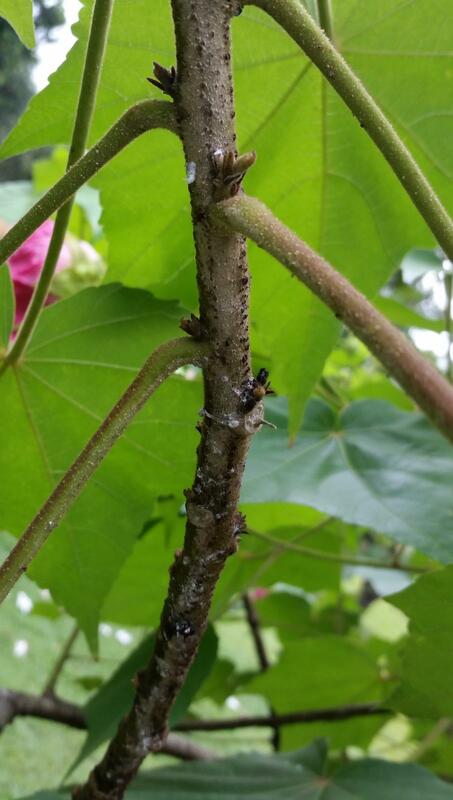 After the 2nd year we found an infestation of white aphid like bugs; well not the bugs but their cocoon-like bubbles spread fast from the stems to the broad underside of the leaves, and then the tops of the leaves, and then migrate to neighbor shrubs and trees killing them in time for sure. The tree/shrub can be planted by stem cuttings that we moved to our new yard, and still the white cotton things with hard balled interiors appeared. Are these mealybugs? I've seen a commercial pesticide on these pages. Is this the best there is? The white cotton-like pests are immune to all the common pesticides from simple soapy water to poisons that would kill the plant. That is, the white pests appear on new cuttings indicating they have not been fully killed. This year for the first time the plant blossomed in all its true glory … and now again the blasted white bugs appear. 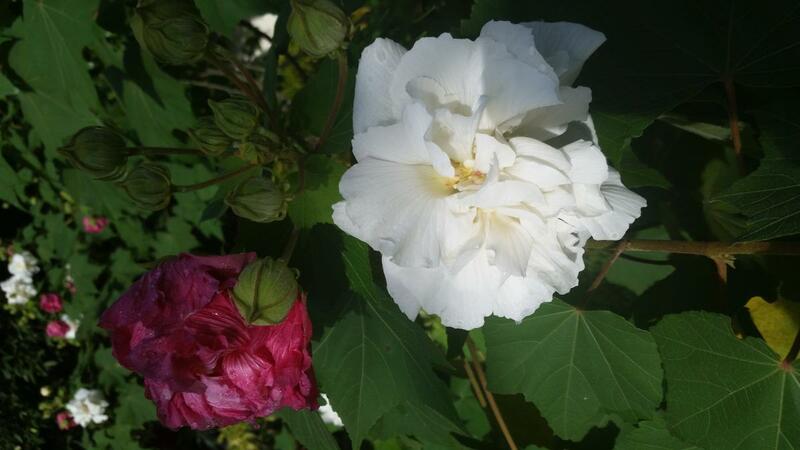 Research shows this plant is commonly called a Cotton Rose tree, Confederate Rose tree, or a Snow Flower tree [Hibiscus mutabilis]. It is grown either as a large shrub or small multi-stemmed tree that reportedly can be as high as 15 ft (4.6 m) high with spread of about a 10 ft (3 m) spread. 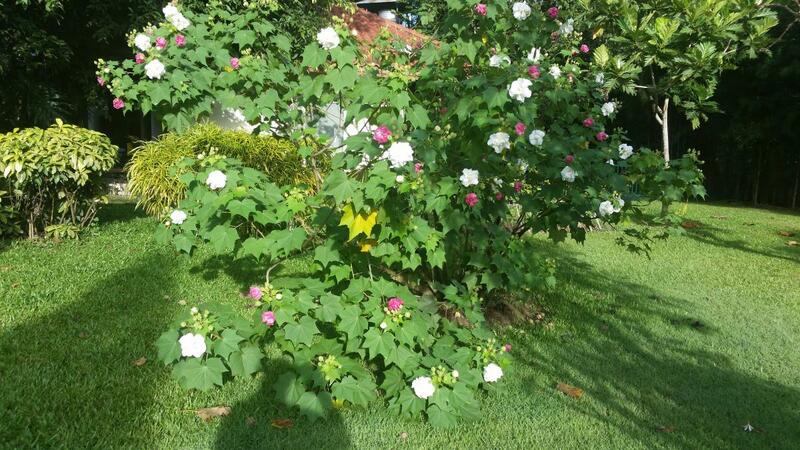 Neither a confederate tree (it hails from China but has taken a liking to the US southland), nor a rose (it's in Malvaceae, the hibiscus family), the flowers open pure white in the early morning and change colors in one day, turning pink by mid-afternoon and the next morning turning a deep pink to a dark "blue-pink" hue. They look like mealybugs, though your pic isn't that clear. I always get mealybugs and whitefly mixed up, so when you talk about cottony type stuff, it could well be whitefly. Soapy water should sort out both of them. I think that part of the problem is that when you do succeed in killing them, you don't realise because the bodies etc remain. Also re-infestations occur rapidly. I find that regular spraying with EM diluted 500:1 is effective. You could also try planting something like marigolds, tomatoes or chilies nearby as you may find that the insects prefer to colonise them than your shrub. That may or may not be the case, but if it works, it is a lot easier to deal with an infested marigold than a large plant. Thanks for all the good advice; hoping no rain this morning as we will spray proper dilutions of wood vinegar to try to stem the bugs and repeat in 7 days just to be sure; as the males fly and the females proliferate with hundreds of eggs, simply transferring the bugs to other "lesser" plants does not seem to be a viable option, but thanks for the suggestion. We will also spread ant powder along the base of our many trees and report here our hoped for success. A follow up: the advice has been great. 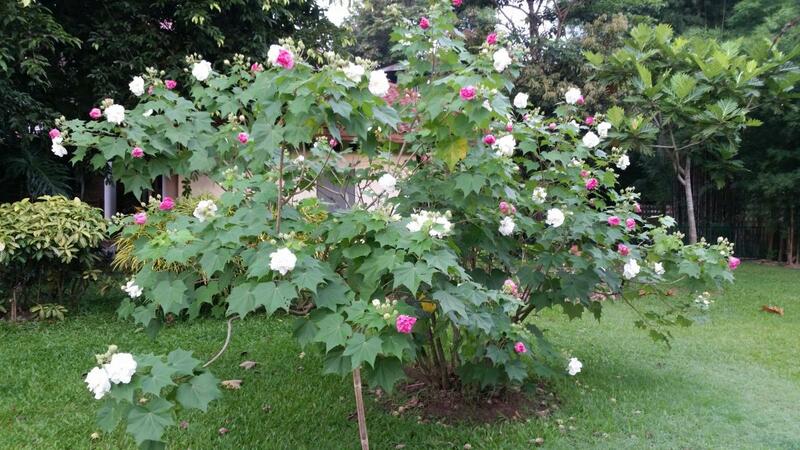 The Cotton Rose Tree has been both identified and seemingly cured of mealy bugs. We first used store-bought wood vinegar diluted with water 1L::20L and sprayed 6 days and 12 days after the first application to be sure to get the living bugs and their eggs waiting to hatch. The 2nd and 3rd applications were with locally made wood vinegar. We also placed ant powder at the base of the trunks to stop the ants from transporting mealy bug eggs. The results are nothing short of spectacular. Thank you for your help. In this thread some posts mention the pyrethrum. Is there any available in Thailand? At first I thought you were mistaking pyrethrum (the botanical) with permethrin, the synthetic, because I'd never seen pyrethrum on spray cans, but then trusting that SammuiJimmy knows better than that, I got curious and found this online. Could somebody that reads Thai please tell us the Thai name for pyrethrum or pyrethrin. The name is confusing: Permethrin is the synthetic "pyrethroid" along with derivitives like cypermethrin and alphacypermethrin (Chaindrite products). Pyrethrum is the natural substance in a certain chrysanthemum species that is extracted to make pyrethrins, the botanical insecticide component. The botanical pyrethrum/pyrethrin is a contact insecticide with a short residual effectiveness, it biodegrades within 12 to 24 hours with sunlight, which make it organic program compatible. Permethrin, the synthetic, has a longer residual activity, and is therefore more likely to kill beneficials, which makes it not acceptable in organic programs. Using pyrethrin, you have to spray it on the insect pest itself to get control, whereas permethrin is also a contact spray, but will stay on foliage and stems, especially if you use a spreader/sticker, and the insect pest will contact it when it feeds even days later. Pyrethroids do not go systemic, they have to be contacted or ingested, so they are most effective for chewing insects like caterpillars. As a contact spray it is a fast kill. I use pyrethrins and sometimes permethrin, on certain tree defoliating caterpillars in California and they fall out of the tree before I can get out of the way. If you can combine a pyrethrin product with a neem (sadao) product (repellent, anti-feedant, reproductive disruptor) then you have an effective organic program compatible insecticide; the pyrethins kill on contact, and the neem has some residual, but only for a few days. So this has to be a repeated application weekly during height of infestation, or two weeks for preventive spraying during possible infestation period. That's what makes the longer residual, synthetic version, more popular and cost effective for non-organic programs. The spray can may be good for small scale use, direct contact on mosquitos and house flys, etc, but for farm/garden use you will need a larger amount to tank mix. I used to buy a concentrated pyrethrin product at an organic specialty shop, in a row of shops at Big C parking lot on the SuperHwy south of Chiang Mai, near Sarapee. It was run by the guy who had a Thai radio show on organic farming. I'm not sure he is still in business there. There was another organic supply shop near Chiang Mai's Kamtieng plant market, but on a side road, not in the market place; some of the shops in the Kamtieng market, and probably in Chatuchak market in Bangkok, carry organic products. Sorry I can't find exact info, but yes it is available but not widely conventional. If we get help with a Thai name you may find it more easily. I don't think that the Thai will help much. "Intended to eradicate cockroaches, mosquitoes and cockroaches." A lot of helpful information, great! Still, someone knows what Pyrethrum is called in Thai? I am sure they have at Chatuchak or Kampeang Phet road. But they don't know the English name. Thanks Loong, for the translation. After looking more closely at the label I realized that the Kayari is misrepresented. Yes, it has pyrethrins, but the other two active ingredients are synthetics, pyrethroids. It's probably very effective, but not organic program compatible. Why pay for deceptive marketing, thinking you are getting a natural, botanical extract product. Other pyrethrins products may contain piperonyl butoxide as an adjuvant to make the pyrethrins more effective. I am NOT advocating for growing or consuming cannabis in Thailand, it is illegal. But due to the legalization in the USA, there is a tremendous amount of useful information becoming available with the high level of research and development and regulation. Some of this information can be valuable for growers of other plants and crops. Because cannabis has another dimension of consumption besides the edible aspect, inhalation presents even more risk of toxicity and therefore more need for scrutiny by growers, consumers and regulators. Something that has just come out for growers in California, may be useful for organic growers here. Reviewing these lists of chemical and biological pesticides that are permitted or not permitted, can be useful for determining what products may be harmful or not with food crops or tobacco. This information on a state government pesticide regulation department website, is one of the benefits of legalization. Has any one seen this product or similar in Thailand? Yes. I haven't seen that brand but the chemistry is available. The active ingredient is permethrin, a pyrethroid (synthetic insecticide based on the botanical chemistry of pyrethrum or pyrethrins from a chrysanthemum flower), The organic botanical product is just as potent for contact knock down, but it biodegrades in 12 hours, so doesn't have any residual. The pyrethroid has longer residual effectiveness. The product label is not familiar to me, is this from the UK? The active ingredient is listed as 250 gm/kg which is 25% a.i. 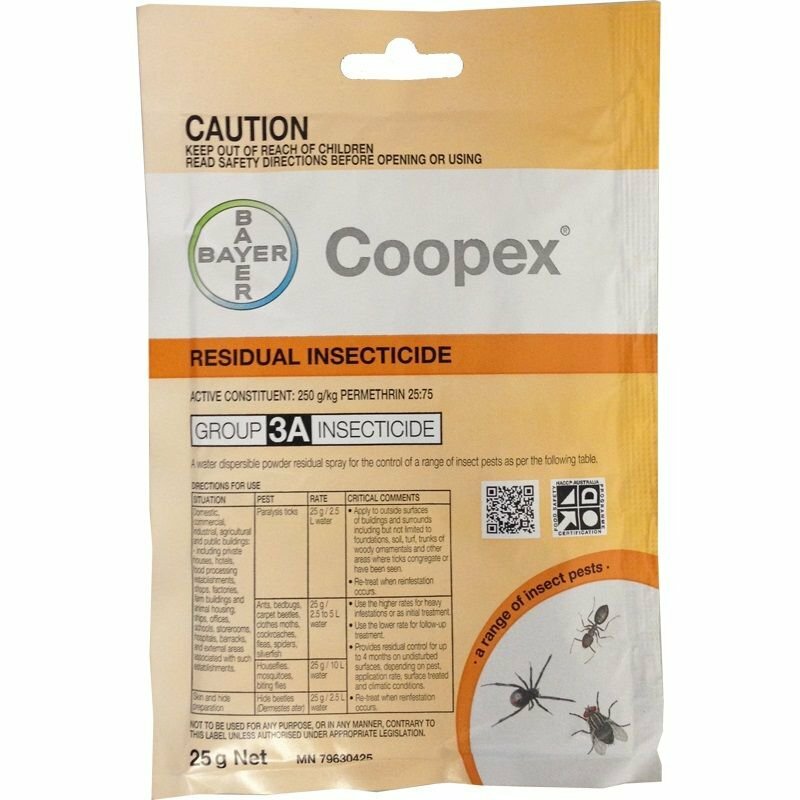 The permethrin that I have purchased here was 10% so the mixing rates will be different, depending on what your target pest is. Permethrin is low toxicity for mammals but is highly toxic to fish, and honey bees. It is not as common on the retail shelf as other pyrethroids: cypermethrin, alphacypermethin, bifenthrin, and some others with "...thrin" in the name of the a.i., but but they have similar chemistry and action. Not systemic, but contact knock down and residual for feeding or repellent. Bifenthrin has the longest residual, depending on the mix rate. What is your target pest and stage of infestation, early or advanced and what are you seeing for plant damage or other signs? Since you are posting in the organic forum, you may want to consider IPM based management practices, biological control and bio-pesticides as needed.